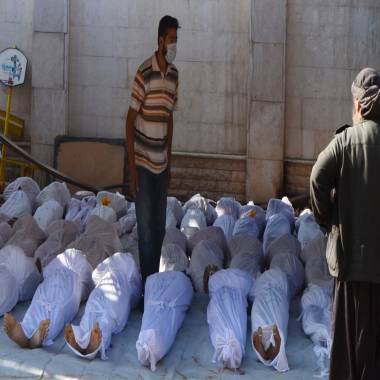 The White House on Wednesday demanded that United Nations inspectors be given immediate access to a site near Damascus where Syrian opposition activists claimed hundreds were killed in an overnight nerve gas attack. “If the Syrian government has nothing to hide and is truly committed to an impartial and credible investigation of chemical weapons use in Syria, it will facilitate the UN team’s immediate and unfettered access to this site,” White House spokesman Josh Earnest said in a statement Wednesday. “We are working urgently to gather additional information,” Earnest said. The allegations of a new chemical attack in eastern Ghouta, near Damascus, came just two days after a UN chemical weapons inspection team arrived in Syria, after months of protracted negotiations. The White House on Wednesday joined the United Kingdom, France and Saudi Arabia in demanding that the inspectors be allowed immesiate, unfettered access to the site. The United Nations Security Council was also expected to hold an emergency session on the new Syrian chemical claims on Wednesday. The latest grim allegations came as the top US military officer said Syria’s divided rebels are not ready for U.S. military intervention to hasten the fall of Bashar al-Assad. “Syria today is not about choosing between sides, but rather about choosing one among many sides,” Gen. Martin Dempsey, chairman of the Joint Chiefs of Staff, wrote in a letter (.pdf) to House Foreign Affairs Committee ranking Democrat Elliot Engel. President Obama interrupted his vacation Thursday to announce that the United States will cancel a planned joint military exercise with Egypt to protest the government crackdown on Muslim Brotherhood protesters yesterday that killed over 500 people. But, Obama said, broader American interests mitigated against canceling the over billion dollars in US aid to Egypt at this time. “Given the depths of our partnership with Egypt, our national security interests in this pivotal part of the world, and our belief that engagement can support a transition back to a democratically- elected civilian government, we’ve sustained our commitment to Egypt and its people,” Obama said in a statement from Martha’s Vineyard, Massachusetts Thursday. US Defense Secretary Chuck Hagel, in a phone call with Egypt’s defense minister and de facto military ruler Gen. Al-Sisi, “made it clear that the violence and inadequate steps towards reconciliation are putting important elements of our longstanding defense cooperation at risk,” he said in a statement Thursday. Former US Ambassador to Egypt Frank Wisner deplored the violence, but said there were many warning signs that the protracted standoff between Egypt’s interim government and supporters of Egypt’s ousted president Morsi was heading towards confrontation. “Without in any way leaving the impression that I think the bloodshed [is excused], this has been about the least surprising outcome,” Wisner, who served as Obama’s special envoy to Egypt in 2011, told Al-Monitor in a telephone interview Wednesday. Wisner cautioned Washington against overreacting, stressing U.S. statements need to strike a balance, to keep ties with Cairo from further fraying and to try to urge the political transition back on track. 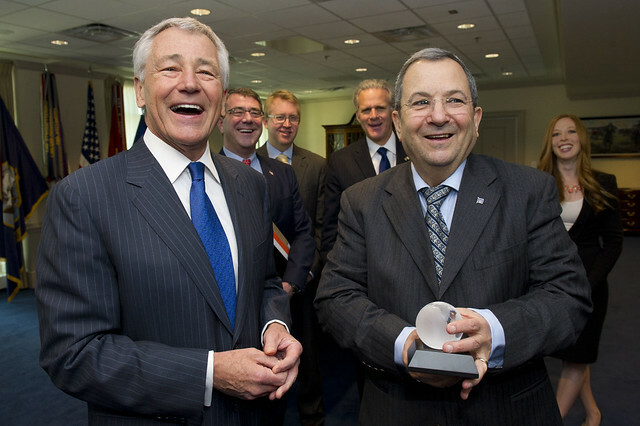 Newly confirmed US Defense Secretary Chuck Hagel on Tuesday met with visiting Israeli Defense Minister Ehud Barak, in his first bilateral meeting with a foreign leader since taking the helm of the Pentagon last week. The two defense chiefs discussed Syria, Iran and continued US support for Israel’s qualitative military edge and anti-missile defense systems, despite looming US budget cuts, Pentagon spokesman George Little said. On Syria, the two defense chiefs discussed “the need for the Syrian regime to maintain control over chemical and biological weapons” in that country and pledged to “continue U.S.-Israel contingency planning to counter that potential threat,” Little said. Senate Armed Services Committee Chairman Carl Levin charged panel Republicans with going overboard in their demands for financial information from Defense Secretary nominee Chuck Hagel. 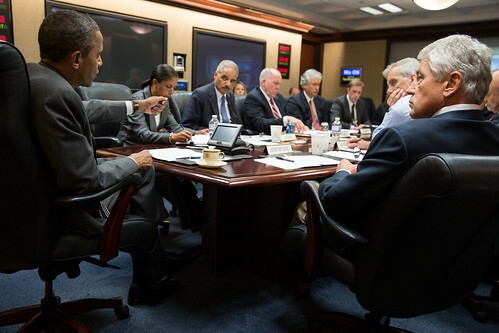 Hagel “has provided all the financial information the rules of the committee require,” Levin (D-Mich.) said Thursday. “The committee cannot have two different sets of financial disclosure standards for nominees, one for Senator Hagel and one for other nominees,” Levin wrote in a follow up letter Friday to the panel's ranking Republican Sen. James Inhofe (R-Oklahoma). Republican Senators appear “to insist upon financial disclosure requirements that far exceed the standard practices of the Armed Services Committee and go far beyond the financial disclosure required of previous Secretaries of Defense,” he wrote. Levin said he intends to schedule a vote on Hagel's nomination “as soon as possible.” Hill staffers suggest that may come early next week. As Iran continues to balk at scheduling new nuclear talks, six world powers are prepared to wait them out. European diplomats said this week that Iran was giving them the run-around in scheduling a new round of talks. In the latest salvo in the blame-game over the delay, Iran’s Supreme National Security Council claimed in a statement Friday that it is actually the P5+1 asking to push back the meeting. Deputy EU negotiator Helga Schmid called her Iranian counterpart Ali Bagheri Friday, to ask to delay the meeting ’til February “because the P5+1 isn’t ready,” Iran’s Fars News Agency reported Friday. “Bagheri…asked [the] P5+1 to be committed to the fixed dates in January,” the Iran NSC statement said, implying the six powers were the ones holding up resumed talks. Tehran’s procrastination is meant to show that the Western sanctions are not working and they are in no big hurry to get back to talks, Iran expert Trita Parsi wrote at the Huffington Post Thursday. But it may also be driven by Iranian fears that they will be blamed if the meeting fails, over what Iran sees as a paltry offer, he said in an interview Friday. But the P5+1 is not going to improve the package to reward the Iranians for not coming, diplomats and analysts told the Back Channel, even as Iran is intent on showing the sanctions are not so devastating that they are desperate for a deal. The Iranian calculation that delay favors their negotiating leverage is likely mistaken, Maloney said. For the United States and P5 partners, “you sit and wait them out,” Maloney, now a senior fellow at the Brookings Institution, said. While Iranian sources have suggested they are trying to press the P5+1 to put discussion of sanctions relief on the agenda for a new meeting, western diplomats say it’s simply “not true at all” that the group has resisted discussing sanctions relief, a European diplomat told the Back Channel Friday. Former Obama White House Iran strategist Dennis Ross said he expected Iran would likely show up for talks in February or so. Maloney agreed Washington doesn’t need to go overboard to correct any Iranian misreading of Obama’s new national security team as being averse to the use of force if diplomacy with Iran fails.